Like all good parents, when Anna and Jason first noticed unusual behavior in their young son Ian, they visited their pediatrician. Perhaps his irritability and rapid eye movements could simply meant he needed glasses. Instead, what they found out they were about to face is every parent's worst nightmare. A CT scan revealed Ian had a brain tumor, and suddenly the family was thrust into the battle of their lives. 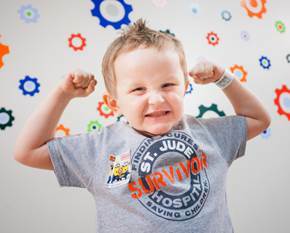 Thankfully, their battle brought them to St. Jude Children's Research Hospital where Ian underwent surgery to resection the tumor. He also received four rounds of chemotherapy, followed by proton therapy. Ian's parents are thankful for the treatment their son received at St. Jude. "The staff wants to do everything they can to let these kids live full and productive lives," Anna said. "St. Jude is such a positive place." Ian, now seven years old and a brain cancer survivor, just happens to love to run. His family has formed a St. Jude Heroes Team, and will be running in the St. Jude Country Music Marathon (a Rock "N' Roll Series race) in Nashville on April 25. 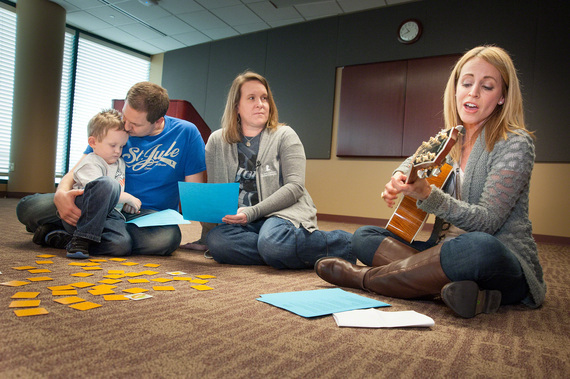 When acclaimed country music singer/songwriter Jenn Schott heard about Ian and his team of runners, she was moved to compose a song about it. Together with her writing partner Michael White, Schott wrote a song for Ian called "Winning." Recently Schottt packed up her guitar and drove from Nashville to St. Jude in Memphis, to perform the song for the first time. Her very special audience was Ian and his family. With lyrics like "Long as you're moving, you're flying, you're a hero with every step. Life`s a race, set your own pace. 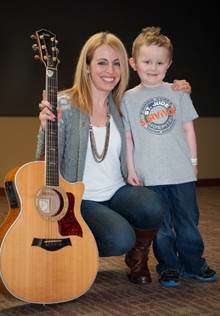 As long as you're running, you're winning," Schott says the song and Ian represent the children who are fighting cancer at St. Jude and winning their fight, thanks to the lifesaving treatment they receive there. Schott currently sits on the Nashville board of the non-profit Girls on the Run, and will also be running as a St. Jude Hero in a few weeks, as well as performing Ian's song at the pre-race pasta party for Heroes. Last year, the St. Jude Country Music Marathon drew visitors from all 50 states and 26 countries, leaving an economic impact on the city of Nashville of roughly $40 million dollars. 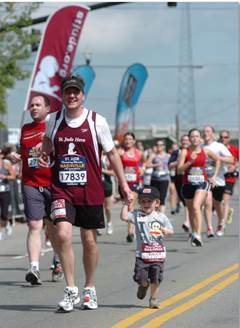 Every year, thousands of runners of all skill levels run races across the country as Heroes for St. Jude. This year St. Jude will have opportunities for Heroes to run in many of the popular Rock 'N Roll Series races in cities such as Portland, Chicago, Seattle, Savannah, Phoenix, Dallas, New Orleans, and San Fransisco just to name a few. In addition, if you are already a runner and failed to gain a lottery entry into the New York City Marathon or the Chicago Marathon, guaranteed entries are available for those running as St. Jude Heroes. For now, both Ian's and Schott's teams of Heroes are in the thick of training for their upcoming race, but long, exhausting runs are nothing compared to fighting childhood cancer. They run the tough runs now, in hopes of giving other kids like Ian a chance to live. Ian's journey is an inspiration not only to members of the country music industry, but to all of us, and his family remains grateful everyday that because of St. Jude, he is winning his fight. Schott sums up Ian's race to live best when she says, "This is about winning and one step in front of the other and the twists and the turns that it takes. "